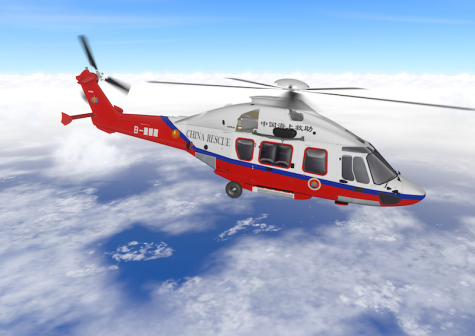 ATLANTA, Georgia --- The Rescue and Salvage Bureau (CRS) of the Chinese Ministry of Transport (MOT) is extending its medium class search and rescue helicopter fleet with the Airbus H175, beginning with a signature for two aircraft in search and rescue (SAR) configuration. These new H175s will perform SAR missions in one of the world's busiest areas for marine traffic (seven of the 10 busiest container ports in the world are located in China) as well as other important offshore areas like the Bohai Sea and the Yellow Sea. These heavily trafficked waters represent a demanding operational environment where pilots must always be prepared for the unexpected. The H175's SAR configuration was chosen for its endurance, long range, highly flexible cabin, and the Helionix avionics system which eases pilot workload and improves situational awareness. The MOT/CRS has been one of Airbus' most important customers in China for more than 10 years, today flying four H225s. It operates four main air bases along China's coast: Shanghai, Penglai, Xiamen and Zhuhai. This selection of the H175 SAR version follows the one of the Government Flying Service (GFS) of Hong Kong, which took delivery of the first multi-service configuration, which includes the SAR configuration, in June 2018. "The H175 is proving its place as a trusted partner for maritime search and rescue missions, as we're seeing today in China," said Bruno Even, CEO of Airbus Helicopters. "Thanks to the Chinese MOT/CRS's continued confidence in Airbus, and our close partnership with the Aviation Industry Corporation of China (AVIC), the H175 will aid additional rescue personnel in saving more lives and vessels in distress along China's coastline." The H175 is suited to perform a wide range of public services missions such as search and rescue (SAR), emergency medical services, law enforcement, firefighting as well as land and maritime border control operations. It benefits from more than 20 certified cabin configurations which can be easily re-configured based on mission requirements. The H175 was conceived from the start to offer the highest safety levels in all flight modes as well as the highest performances on the super medium range. It shares with the H135, H145 and H160 the state-of-the-art Helionix avionics suite, which bolsters the helicopter's search and rescue capabilities. Today H175s are in operation in the Netherlands, the UK, Denmark, Thailand, Australia, Mexico and Hong Kong, China. Airbus is a global leader in aeronautics, space and related services. In 2018, it generated revenues of €64 billion and employed a workforce of around 134,000. Airbus offers the most comprehensive range of passenger airliners. Airbus is also a European leader providing tanker, combat, transport and mission aircraft, as well as one of the world's leading space companies. In helicopters, Airbus provides the most efficient civil and military rotorcraft solutions worldwide.